The fact that the exercise mirrored the exact locations and times of the bombings is light years beyond a coincidence. Power said the drill focused around 'simultaneous bombings'. At first the bombings were thought to have been spread over an hour, but the BBC reports just today that the bombings were in fact simultaneous. Mr. Power (pictured above) and Visor Consultants need not have been 'in on the bombing' or anything of that nature for this to be of importance. The British government or one of their private company offshoots could have hired Visor to run the exercise for a number of purposes. The exercise fulfils several different goals. It acts as a cover for the small compartmentalized government terrorists to carry out their operation without the larger security services becoming aware of what they're doing, and, more importantly, if they get caught during the attack or after with any incriminating evidence they can just claim that they were just taking part in the exercise. The large numbers of 'blips' on NORAD screens that displayed both real and 'drill' hijacked planes explain why confused press reports emerged hours after the attack stating that up to eight planes had been hijacked. The US government has been caught planning to carry out attacks and carrying out attacks. The British government has been caught red-handed as well. Members of Vladimir Putin's FSB were caught planting bombs in a Russian apartment building in 1999 by the Moscow police. This is not speculation. Kermit Roosevelt admitted on NPR radio that in 1953 the CIA and British intelligence carried out a wave of bombings and shootings in Iran. He then went on to brag about how they subsequently blamed the bombings on Iran's President, Mossadegh. Do you understand, these people brag about what they do 40 years later? The bombing in Bolognia was part of a CIA operation code named Gladio, where the US government would pay right-wing terrorists to carry out bombings to be blamed on leftists in Europe. All of this was blown wide open when two of the Bolognia bombers were convicted in an Italian court, forcing them to spill their guts admitting that they were neo-fascists contracted by the CIA. Operation Gladio documents have since been declassified. 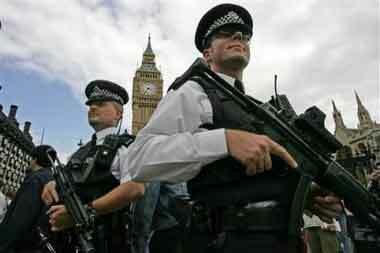 The London terror alert level was lowered before the bombings took place. This gave the perpetrators extra cover to plan and execute the attack without having to evade the most stringent security. In any crime you look at history and motive, The British government has been caught in multiple examples of carrying out bombings in London which were then blamed on the IRA. 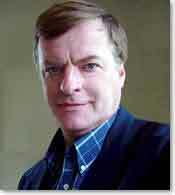 They even had one of their own MI5 agents within the Omagh bomb squad. Click here for an archive of this evidence. The wider agenda will become clearer when Blair firmly points the finger at the selected patsies designated to take the fall. But for the moment he's happy to grandstand as the courageous leader who immediately returned to London to take control of the chaos. 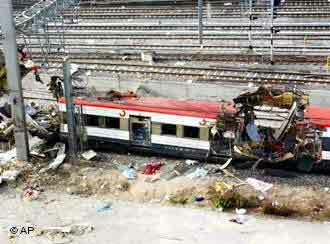 The Madrid train bombing is another example. The bombers were found to be police informants with close links to the Spanish security services. They had access to the most secure areas of the Madrid train system. The Spanish government initially tried to blame the Basque group ETA for the blast in the hope that the people would rally behind the government and get them re-elected. After ETA denied involvement and the people started saying the government was involved, the Spanish government had to blame Al-Qaeda and kill some patsies by claiming they blew themselves up during a raid. Here we go again... 7/7 Mock Terror Drill: What Relationship to the Real Time Terror Attacks?